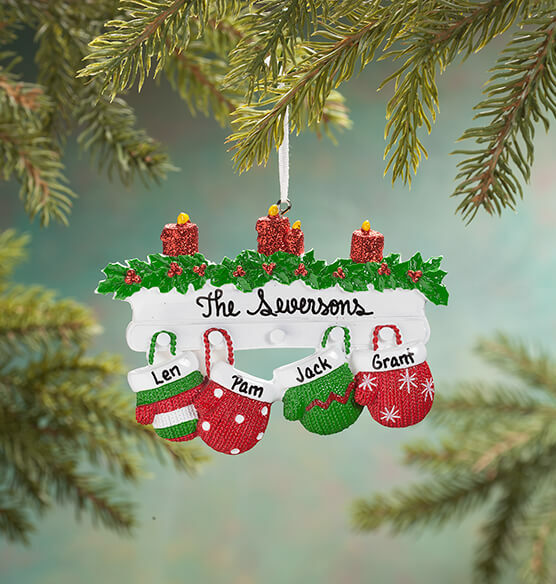 Lovingly "stitched" with sentiment and style, this personalized family mittens ornament will be made for one special couple, family or group. We'll add family name, message or date on the festive mantle, along with 2, 3, 4, 5 or 6 first names on each incredibly detailed mitten. Specify family name/message; limit 1 line, 18 letters/spaces. "The" is not standard. Specify 2, 3, 4, 5 or 6 first names; limit 1 line, 8 letters/spaces each. Resin. Christmas ornament measures 3 1/2" x 5". Personalized Family of 2 , Personalized Family of 6 , Plain Family of 2 , Plain Family of 6 are not available at this time. This ornament is very detail. I gave it as a gift and the family thought it was so cute and detailed. I'm looking to purchase again for another family. I am going to be buying more products in the future! 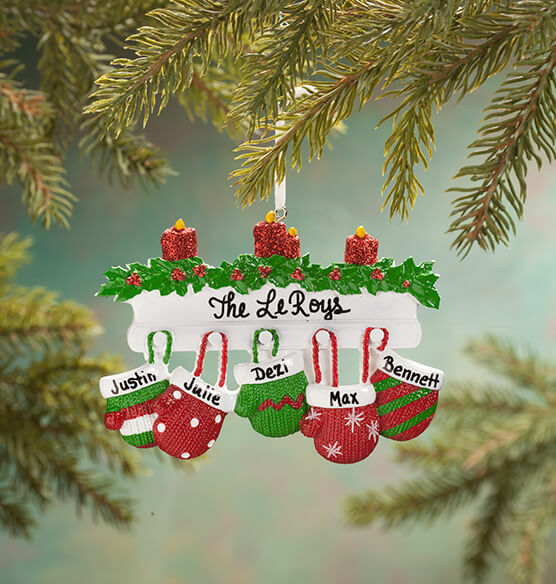 I ordered a personalized family ornament that is hanging on my christmas tree. It's beautiful and we love it! I like that the picture is accurate once you punch in the personalisation, very handy! I bought the 5 glove one as a gift for my daughter's family, she loved it! I like to get a head start on my Christmas shopping. I always buy family ornaments. 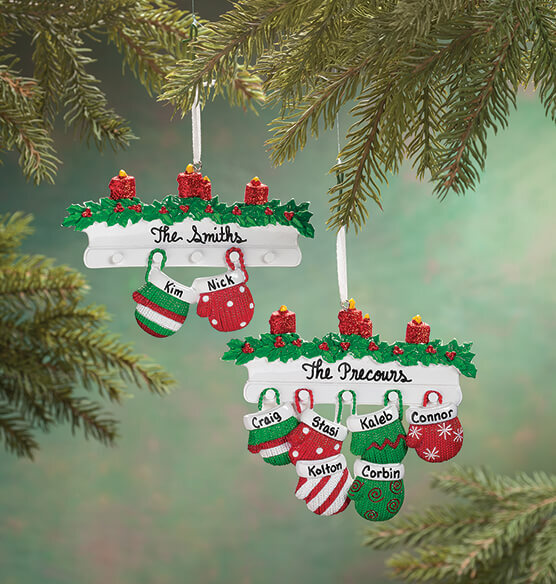 The mitten ornaments caught my eye because they were different than many I have ordered in the past. You never know what something will look like when you order online, but they are very cute. I think I'll wrap them and hand them out at Family Thanksgiving so they can be on the tree for the whole Christmas season. Happy Birthday, Jesus!!! I purchased several of these for families with pets. I added an extra mitten for the year! Very nice quality. D.H.
Was much loved and appreciated by the receiver... its nice to gift personalized items...means so much more at such an affordable price...not to forget FREE SHIPPING ?????? Mittens go with kittens. This year, we gave out kittens these mittens as their Christmas tree ornaments. We liked them. I think they may have liked the catnip toys a bit better. I've been buying ornaments for my grandchildren since they're born and I have one that's 21 one that's 19 and one that's 11 years old. 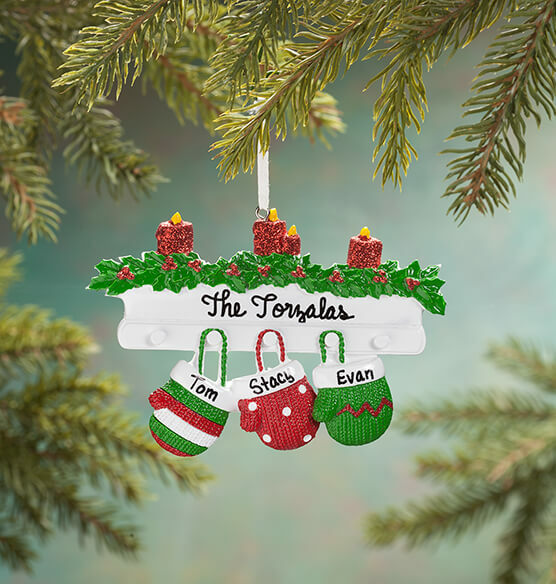 and they're building up ornaments for their Christmas trees when they have a home of their own. It’s cute and it was quick and easy to personalize.